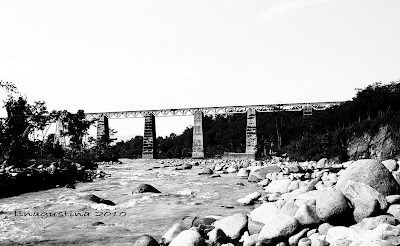 This railway bridge located in my husband’s hometown (Bumiayu, Central Java, Indonesia. Local people there call it Saka Limalas (Fifteen Poles) as the bridge has 15 supporting pillars. It’s one of my favorite spots! Great bridge, very many patterns. Great image ... would like to see the brigde a bit closer. Think it´s an interesting construction. Bridges are interesting subjects - there are always some lines and structures to work with, and this was a nice example. Reminds me of an old movie, A Bridge Too Far. I'm always fascinated with Bridges.